Happy New Year everyone! We are starting the New Year with a bang; the European Beer Challenge is back! 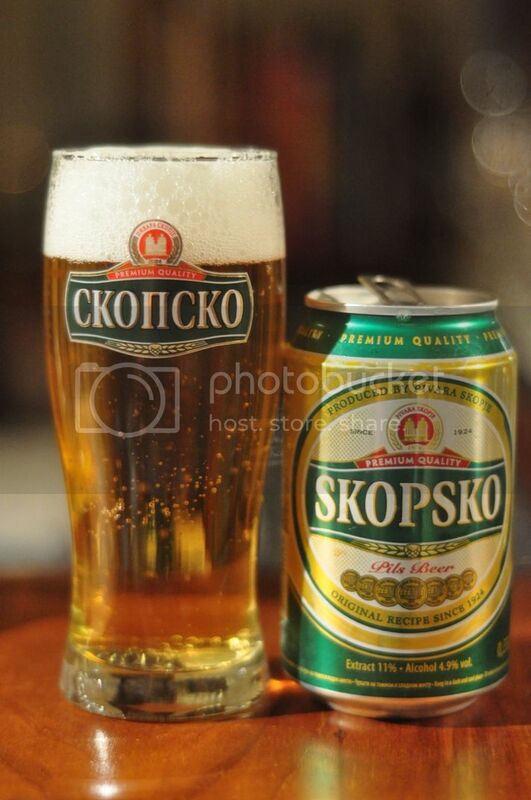 I am lucky enough to have recently received some Skopsko, the national lager of Macedonia. What better way to bring in the new reviewing year than to tick off another country! With the relatively large Macedonian population in Melbourne I didn't think it would take until the 45th beer of the European Beer Challenge to find this beer. Apparently 4 or 5 years ago it used to be widely available but then the importer went broke. These things happen but it made my life more difficult so many thanks are owed to Svetlomir who picked this up on his recent trip to Macedonia. Another interesting note about the can is that on one side it has English lettering and on the otherside is Cyrillic lettering (see inset). Anyway the beer pours a clear deep golden colour with a good sized white head on top. There appears to be adequate carbonation rising to the head which spurs on excellent retention. Overall it's a very nice looking lager. 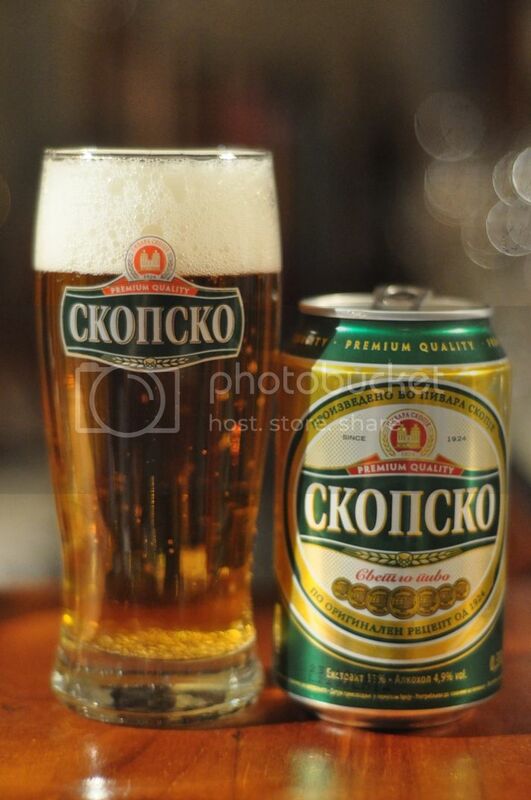 Unlike many macro lagers around the world Skopsko is a German Pilsner. This shows through in the nose, which is a beautiful balance between malt and hops. At first the beer has quite a light, almost straw-like, malt base before some grassy and floral hops take over. The provide more than adequate bitterness for the style and they seem to give off a little feel of quality. The flavour is actually really nice. Macedonia's national lager is a beautifully balanced beer, with the perfect mix of malt and hops. The beer has a light flavour of slightly sour grains before being swamped by bitterness from the hops. The hops have not only grassy and floral flavours that were present on the nose, but also citrus and almost spicy notes as well. There is just enough carbonation to tingle the tip of the tongue while drinking. God this beer would be easy to drink heaps of! Skopsko is one of the better macro lagers that I've ever had. It's nice and bitter and incredibly refreshing. It's got a little bit more to it than your average macro lager and offers something that craft beer drinkers could appreciate, flavour! If someone is looking for a new lager to import they could do worse than bring this back out here, it would sell well. Thanks again to Svetlomir and if anyone else can help with any of the remaining countries we can work something out.